Nihi Sumba in Indonesia offers honeymooners the chance to return every seven years compliments of the resort. •	Guests will be able to return every seven years to enjoy Nihi’s memorable experiences including yoga amidst rice fields, picnics at local waterfalls, surfing the Occy’s Left and a unique ‘Spa Safari’ around the island. Until December 2020, couples who spend their honeymoon at Nihi Sumba, in Indonesia will now be invited back every seven-years courtesy of the resort. This unbeatable anniversary gift allows guests to relive the romance of their honeymoon with a complimentary five-night stay. Situated just an hour’s flight away from Bali, the resort’s beauty is nothing short of extraordinary and despite the fact that it resides just 250 miles away from Bali at twice the size, the island still remains largely untouched by mass tourism. Sumba is a magically pristine land of beaches, tropical scenery and a fascinating tribal culture, perfect for those in search of an off-the-grid, secluded honeymoon experience. Set upon 560 acres of lush scenery, Nihi Sumba is the only full service, five-star resort on the island with stunning villas that blend flawlessly into panoramic landscapes. Built with Indonesian Alang Alang, teak and rattan, the design follows the simple and minimal style of Sumbanese architecture providing guests with luxurious, yet traditional accommodation. Honeymooners will not be short of activities to enjoy over their honeymoon or repeat visit with yoga lessons atop the luscious farming fields of Rice Island, a picnic at the break of a local waterfall, horse riding Sumbanese horses along the beach or paddle boarding through the rivers of the nearby villages amongst a plethora of other activities. For those looking for a getaway geared more towards relaxation and rejuvenation, Villa Rahasia provides an idyllic escape. 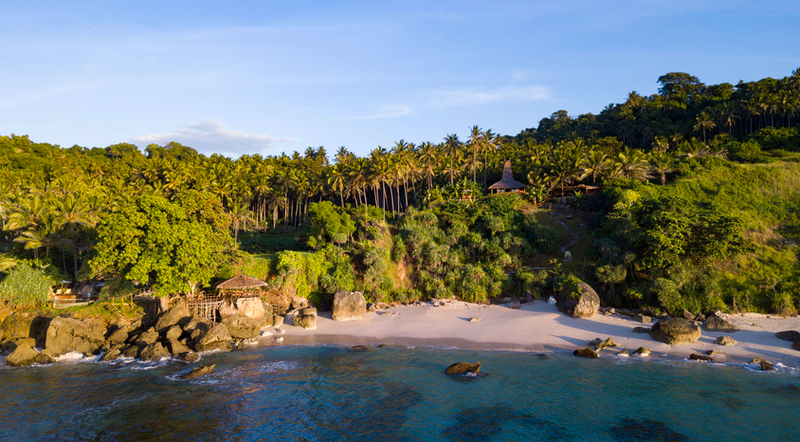 Situated just a 15-minute drive away from Nihi Sumba, this remote getaway sits amongst raw, rural scenery with uninterrupted views of the Indian Ocean. The journey to this tropical chic villa can be made by foot on a romantic sunrise trek through rice paddies of Sumba’s dramatic west coast and into the alluring Nihi Oka Valley where guests begin their ‘Spa Safari’. Here, honeymooners can enjoy unlimited spa treatments, ranging from facials with ingredients harvested from the island such as coconut oil, mint leaves, green tea and red rice. Whilst other therapies include reflexology, deep tissue massages and Indonesian ‘Lulur’ body exfoliations. This remote set up offers the ultimate off-the-grid seclusion that honeymooners are searching for. A key element of every stay at Nihi Sumba includes involvement in the philanthropical work of The Sumba Foundation. Nihi Sumba’s philanthropic arm has seen the funding of wells and education, the lessening of poverty on the island and has helped decrease malaria by 93% to date. The foundation provides visitors with the opportunity to immerse themselves in the true spirit of Sumba creating an unforgettable experience. *The ‘Nihi Forever’ package requires that first-time honeymooners book a minimum five-night stay in 2019 or 2020 by April 30, 2019.